There might not be a bigger point of emphasis for the USC Trojans this week than shoring up the offensive line. 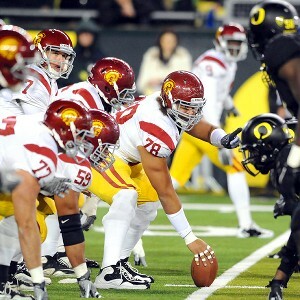 Steve Dykes/Getty Images Without injured center Khaled Holmes, USC's offensive line struggled mightily against Stanford. With four of five starters returning along the line this year, there was a lot of thought that the unit would be one of the best in the country, even if the one player who didn't return was Matt Kalil, the No. 4 pick in the 2012 NFL draft. Against Stanford, however, the Trojans found out how much another loss could hurt when center Khaled Holmes was forced to miss the game after suffering an injury the previous week against Syracuse. With Holmes out of the lineup, the Trojans turned to redshirt freshman Cyrus Hobbi, a player with a bright future who had seen limited reps in early-season action. As it turned out, the matchup was a tough one for Hobbi. The Cardinal played aggressive defense with a solid group that came into the game ranked among the nation's leaders against the run. The constant defensive pressure helped lead to several missed assignments on the line. USC head coach Lane Kiffin said it was the most missed assignments for a line he had ever seen. "We're moving on," USC offensive line coach James Cregg said. "We covered our mistakes in meetings after the game and we know what went wrong. As far as Cyrus is concerned, it was a first game experience in a tough environment. We expect him to be better next time." This is not to lay the blame solely on Hobbi. Yes, he was overwhelmed, but that was a daunting challenge for any player against that particular 3-4 defensive scheme. Hobbi's teammates, including Holmes, have been quick to come to his defense. It's unclear at this point if Holmes will be returning for the upcoming game against Cal, so it's possible that Hobbi will be in the lineup again. The Trojans also might turn to fifth-year senior Abe Markowitz. Markowitz is a former walk-on who earned a scholarship by being a valuable reserve at both center and guard. He was inactive last week during practice, according to Kiffin, but was available to play in the game. The decision was made to go with Hobbi against Stanford, but if Markowitz hears his number called on Saturday, he will be ready. "I just want to get on the field," Markowitz said. "It's been a dream of mine since I've been here to get out there and start. I'm healthy and ready for my opportunity if it happens. "I've been playing guard for a while, so I'm staying after practice this week to work on some snaps. Playing center is a lot more fun than guard, you just get to beat people up." Cregg is also confident that Markowitz will be ready if called upon. "Abe has a lot of experience in our system," Cregg said. "He's a stout guy with good leg strength, a solid run blocker." There also will be an open competition this week in practice for the starting left tackle spot between incumbent Aundrey Walker and true freshman Max Tuerk. Walker was named the left tackle in spring ball after an abbreviated competition with Kevin Graf, but he found out last Saturday that replacing Kalil is not an easy task. Walker struggled, and Kiffin wasted no time in making it clear he wasn't pleased with the effort and was putting the job up for grabs. Everything USC, from recruiting to news to game coverage, is available in ESPN.com's WeAreSC. "Guys are going to make mistakes," Kiffin said. "We can tolerate dropping a ball or getting beat, but what we won't tolerate is a lack of great effort -- not when you put on these jerseys that all of these great players have worn before you. I think Aundrey is going to respond well to this." For his part, Walker is saying all the right things about getting the message and responding the right way. "There's nothing else to it but working hard this week and getting better," Walker said. "Just watch on Saturday night. That's all I have to say: Watch on Saturday night." The Trojans line is sure to be tested by another physical defensive line that might not be as powerful as Stanford's but is one that can present some problems nonetheless. The Bears also mix in different fronts as they look to create space for their linebackers. How the USC offensive line will be able to regroup and respond to this challenge will go a long way toward determining the outcome of the game. Despite making blockbuster deals that brought Hanley Ramirez, Adrian Gonzalez and Josh Beckett to Los Angeles, the Dodgers are struggling to close the gap on both the Wild Card and pennant races, which has increasingly put their playoff hopes into doubt. While the Blue Crew still has the opportunity to make its first postseason journey since losing to the Philadelphia Phillies in the NLCS in 2009, time is ticking away as the Dodgers' offensive woes continue to weigh down the team from their true potential. After an eventful season of transactions this year that brought big-name players and their big-name contracts to the City of Angels, we begin to wonder how the Dodgersâ new spendthrift ownership, Guggenheim Baseball Management, will respond to an unsuccessful conclusion to the 2012 season. Will the new owners go on another massive spending spree if the Dodgersâ recent shortcomings cause them to disappointingly miss this yearâs playoffs? Judging from their recent actions, which stunned many, it seems as though the new ownership will throw cash in any direction to ensure that this team succeeds, an effort that is greatly appreciated by fans. However, after the shock-and-awe of the Dodgersâ monster deal with the Red Sox to bring Gonzalez, Beckett and Carl Crawford to the team has worn off, the management may have learned a valuable lesson: Money canât buy you championships. Not in baseball, at least. On top of that, the owners understand that it takes time for players to acclimate to their new surroundings. All of the new acquisitions, despite their spotty achievements, have struggled since putting on a Dodgers uniform. So, while the new owners would love to create more excitement in L.A. and give the Dodgers an increased chance of succeeding, they also realize that adding superstars can only do so much for a team, and can also backfire in the clubhouse. Furthermore, as much as they would like to support the franchise and its future, there is a finite amount of funds that they can use for playersâ salaries. They incurred $262.5 million in future salaries in the Red Sox blockbuster deal, which is no expendable amount. Other key factors that the new ownership will take into account before embarking upon another expensive endeavor are the underlying reasons why the team has not succeeded this season despite a face lift to its roster. In addition to the struggles of the newcomers, the Dodgers have also been marred by key injuries. Closer Kenley Jansen is having cardiac issues, and most importantly, Matt Kemp was sidelined with a hamstring injury and has recently been struggling since crashing into a wall at full speed in Colorado. Injuries occur to every team, but so many injuries to key players have really affected the team this season, especially in the second half of the season. Lastly, the team has the potential to be a much more cohesive unit after a proper spring training together, which can help set the mold on this group of players. Do you think the Dodgers will go on another spending spree if they miss the playoffs? In all, the overwhelming signs that indicate that the new ownership should be patient before pulling the trigger on a big deal once again. Itâs simply too risky financially and may prove to be a dud or counterproductive like the recent acquisitions have proved to be so far. Chances are that the Dodgers will still make a deal for a pitcher or two in the offseason, but they need not get too desperate. There are only so many moves that a front office can make. A for-sale sign for the owner of the Staples Center arena, the NHL's Los Angeles Kings, Major League Soccer's LA Galaxy and a stake in the LA Lakers would be a major shock to the city's sports, entertainment and business establishment at any time. But when Denver-based Anschutz Co. said Tuesday that it was ''commencing a process'' to sell subsidiary Anschutz Entertainment Group, the announcement left especially big questions about AEG's central role in courting the NFL's return to Los Angeles with Farmers Field, a planned downtown stadium going through late-round approvals with the city. Villaraigosa said both Denver billionaire Phillip Anschutz and AEG President Tim Leiweke have assured him the city's football future will remain the same. The stadium overcame a major hurdle last week when the city's planning commission unanimously recommended that the city council approve its environmental impact report. The council will take up the issue on Sept. 28. If an agreement is reached, AEG and the city have said they would work on the puzzle's most important piece - convincing an NFL team to move - early next year. Councilwoman Jan Perry, whose district includes the proposed stadium site next to the Staples Center, said she did not know about a pending sale but agreed that it wouldn't have adverse effects on courting a team. Perry said the move ''arguably is very positive'' because she suspected it could lead to an enthusiastic new partner anxious to get in on the city's NFL prospects. It wasn't immediately clear how far along the company is in the sale process, or whether it has entertained any offers. The price for AEG could be well into the billions. Anschutz Co. said in the statement that it has hired as financial advisers the Blackstone Group, which recently managed the sale of the Los Angeles Dodgers to a group that includes former Lakers star Magic Johnson. AEG's holdings also include the professional soccer team Los Angeles Galaxy, part-ownership of the NBA's Los Angeles Lakers, and major entertainment and real estate holdings in downtown Los Angeles. Outside of L.A., AEG owns Major League Soccer's Houston Dynamo and New York's Barclay's Center, the new home of the NBA's Brooklyn Nets. It also owns arenas in Sweden, China and Australia. The potential sale was first reported by the Wall Street Journal. AEG transformed the city's landscape with the building of Staples Center and the addition of the LA Live entertainment complex, helping to revitalize a long-neglected downtown and bring energy and several championships to its sports teams. Opened in 1999, the Staples Center is among the world's busiest arenas. It hosted six playoff games in four days for its main tenants - the NBA's Lakers and Clippers, and the NHL's Kings, who won their first Stanley Cup in June. LOS ANGELES (AP) -- Anschutz Entertainment Group, the owner of the Staples Center arena and the NHL's Los Angeles Kings, and the top contender to build a stadium and bring the NFL back to Los Angeles, is up for sale, its parent company said Tuesday. The Denver-based Anschutz Co. said in a statement that it is ''commencing a process'' to sell the subsidiary known as AEG and had hired Blackstone Advisory Partners as an adviser. It wasn't immediately clear how far along the company is in the sale process, or whether it has entertained any offers, but the price for AEG could be well into the billions. The sale would mean a major ground shift in sports and entertainment in Los Angeles and around the world. AEG's holdings also include pro soccer's Los Angeles Galaxy, part-ownership of the NBA's Los Angeles Lakers, and major entertainment and real estate holdings in downtown Los Angeles. Outside of L.A., AEG owns Major League Soccer's Houston Dynamo and New York's Barclay's Center, the new home of the NBA's Brooklyn Nets. It also owns arenas in Sweden, China and Australia. The sale would also throw uncertainty into LA's nearly two-decade attempt to bring the NFL back to the city. The City Council is considering the approval of plans for Farmers Field, a downtown stadium proposed by AEG. Los Angeles Mayor Antonio Villaraigosa said he has long known of the possibility of a sale, and both Denver billionaire Phillip Anschutz and AEG President Tim Leiweke have assured him the city's NFL hopes will remain the same. AEG transformed the Los Angeles landscape with the building of Staples Center and the later addition of the LA Live entertainment complex, helping to revitalize the city's long-neglected downtown and bring new energy and several championships to its sports teams. Opening in 1999, the Staples Center is among the world's busiest arenas. It hosted six playoff games in four days for its main tenants - the NBA's Lakers and Clippers, and the NHL's Kings, who won their first Stanley Cup in June. The Los Angeles Galaxy's Marcelo Sarvas is turning out to be a great addition to the team. In addition, to assisting both goals in the Galaxy's 2-0 victory over the Colorado Rapids, Sarvas made an incredible block on Conor Casey's shot. The save prevented the Rapids from getting back into the game. In addition, it was nominated for the MLS Save of the Week for Week 28. At the beginning of the season, Sarvas spent some time on the bench and playing for the Galaxy's Reserve team. It wasn't until July that Sarvas was consistently in the starting lineup. When the Brazilian midfielder played at least 60 minutes, the Galaxy were 10-5-2. When he played 16 minutes or less, the Galaxy's record was 4-6-2. The Galaxy-Rapids game on September 14 was Sarvas' breakout game. Without David Beckham in the starting lineup, the 30-year-old paired in the midfield with countryman Juninho. In the 15th minute, Sarvas gave the pass to Donovan who fed to ball to Robbie Keane. The Irish striker scored to make it 1-0. In the 58th minute, Sarvas provided the long ball that led to Christian Wilhelmsson's goal. Sarvas' save was the icing on the cake and made him the "man of the match." He was also named to the MLS Team of the Week for Week 28. In the 78th minute, Omar Gonzalez was unable to clear a ball that came into the box. Conor Casey got around our goalkeeper Josh Saunders and took a shot. Fortunately for our side, Sarvas slid into the box and blocked the shot. There's nothing better than when a player steps in for the goalie and prevents a goal. That is true defending. Along with Sarvas, Sean Johnson (Chicago Fire) is nominated for his diving save against Eric Avila's (Toronto FC) corner blast. Then, there was Tally Hall's (Houston Dynamo) "Matrix-like" save on C.J. Sapong's header. Although he stumbled and was behind a lot of bodies, Andy Gruenebaum (Columbus Crew) still tipped Thierry Henry's chip over the crossbar. Matt Reis (New England Revolution) made a one-handed save against Branko BoÅ¡koviÄ's long range shot. As of Sept. 18, Sarvas has over 50 percent of the vote. I imagine he will take the honor. Melissa Matters is a long time Los Angeles resident and devoted Los Angeles Galaxy fan. LOS ANGELES â" Â Matt Barkley and his Southern California teammates spent the past couple of months reminding each other not to get consumed by all the praise being thrown their way. Now Barkley is spending this week making sure the Trojans don't get distracted by disappointment after their season got derailed at Stanford â" and he's got to start with himself. "I wasn't expecting that was going to happen this year," Barkley said Tuesday after another early-morning practice. Three days after their 21-14 loss, No. 13 USC still can't quite believe how quickly its imperfections were exposed. The Trojans (2-1, 0-1 Pac-12) strenuously avoided buying into the hype around their comeback season from a two-year postseason ban, yet they returned to practice determined to prove they're still better than the struggling team that lost to Stanford yet again and plummeted 11 spots in the rankings. Barkley was crushed after the game, his senior season getting off to a start he never expected. Yet Barkley's determination to grow as a leader forced him to find a mature perspective on the loss: It's only September, after all, and the Trojans' dreams of major postseason success are very much alive. Still, it stings, even three days later. "The shock behind that, I wasn't expecting to happen," Barkley said. "I learned a lot from a defeat like that. You learn to come back the next day and to be the voice that we need. You've got to make sure it's a quick turnaround." And Barkley realizes the spotlight will be directed squarely at his offense, which improbably was shut out in the second half. USC's stars produced thoroughly pedestrian numbers, and the offensive line deserves much of the blame after looking overmatched against the Cardinal. Barkley went 20 for 41 with two interceptions, while Marqise Lee had eight catches for 100 yards, but didn't score. Silas Redd scored two touchdowns with just 17 yards rushing, and Curtis McNeal ran for only 37 yards. "We're a little bit in shock," said All-American receiver Robert Woods, who had just four catches for 38 yards against Stanford. "But our defense played well. We've just got to produce on offense. That's our job. Our team spirits are still high. We know we can bounce back and play well." The Trojans must patch their struggling offensive line in time to face California at the Coliseum on Saturday, so coach Lane Kiffin has re-opened competition for Aundrey Walker's starting job at left tackle. Kiffin had strong words for Barkley after the game, saying the senior had made some bad decisions, but reserved his strongest criticism for the line that was missing injured Khaled Holmes, its senior center and leader. "We're looking for finish," Kiffin said. "Guys are going to get beat. Guys are going to drop balls. You're going to make mistakes, but we won't tolerate lack of great effort, not when you put on these jerseys that all these great players have worn before. I think Aundrey is going to respond well to this." Walker is the sophomore who replaced Matt Kalil, the fourth overall pick by Minnesota in last spring's draft. The 6-foot-6, 300-pounder from Cleveland is learning on the job, but feels he'll outperform Max Tuerk in practice this week to keep his position. "I've just got to work hard and get better, too," Walker said. "It's nothing but motivation to get better. ... Khaled is a smart guy. He's a leader on the team, and we're looking forward to having him come back." Barkley claimed the Cardinal's rush "didn't get to me," but it certainly appeared to succeed during the game. Barkley was sacked four times and hurried several more times, forcing throws into coverage for interceptions. "A million times he's made the right decision there," Kiffin said. "That's going to happen to anybody when you start getting rushed and you're not getting protected the way you need to." Kiffin is watching his Trojans for signs of a hangover, claiming he saw none Tuesday morning. USC has a bye after hosting the Golden Bears, so there's no reason to hold back anything in what's got to be a bounce-back game for a team that still harbors national title hopes after an early-season humbling. "Just watch Saturday," Walker said. "That's all I've got to say."